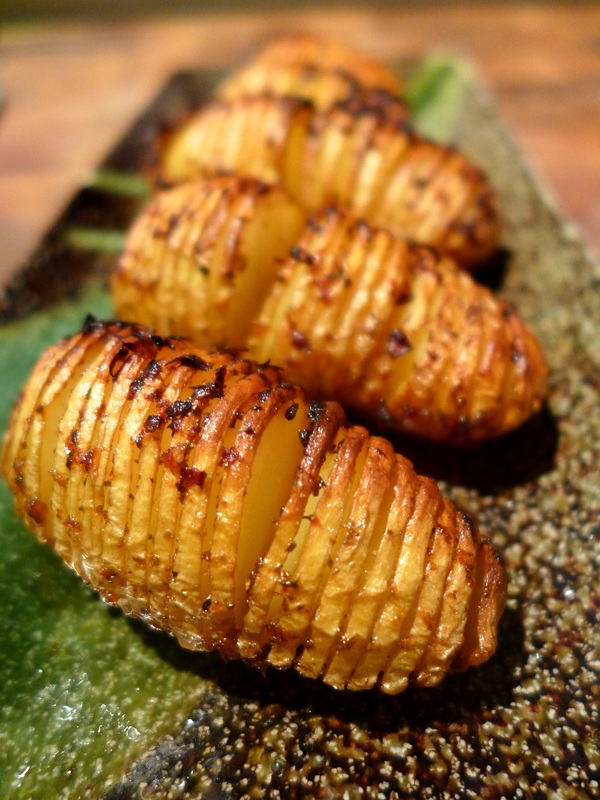 Hasselback potatoes are definitely having a moment and understandably so as they look so appealing and taste so good. Apparently we have the Hasselbacken Hotel in Stockholm to thank for this method of slicing whole potatoes so that when they’re roasted they fan out like an accordion, or as Nigella Lawson puts it, like sauteed potatoes on the stem. Normally they’re just rolled in oil and/or butter but variations on the original theme are legion. I thought they’d be good slathered with harissa as an accompaniment to some peppery sausages and I liked the result. Cooked this way they’d also be good with grilled meats or barbecued mackerel, or for vegetarians, with a big fat frittata. I’ve given the quantities and timings I used but it really depends on how many spuds you’re cooking, of what size, and how hot you like your food. I was using new potatoes. Adjust to your personal tastes, as ever. Pre-heat the oven to 220C/425F/Gas Mark 7. 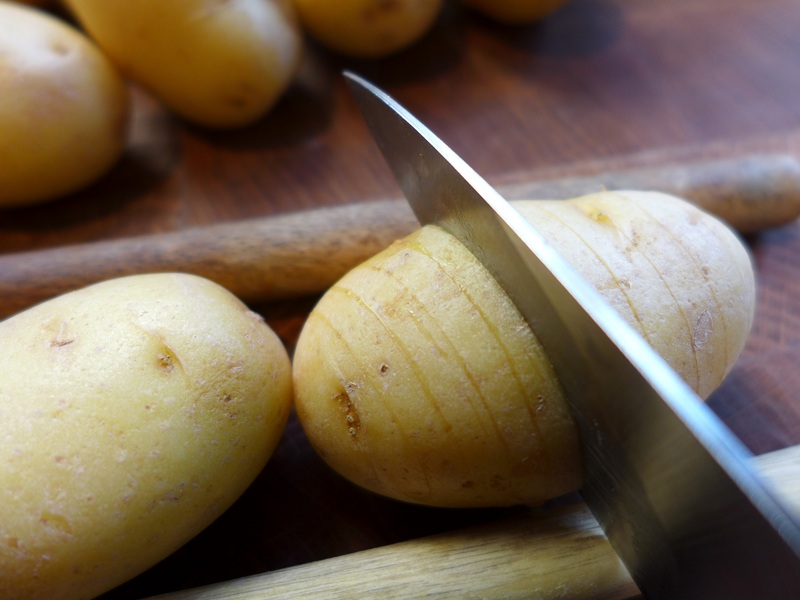 Cut slices approximately 2mm apart across each potato, cutting almost to the bottom but not all the way through. You can sandwich them between the handles of two wooden spoons to make this easier, although I think it’s a method that works better with bigger spuds. Alternatively you can sit them in the bowl of a big spoon or just go free-style. Put a tablespoon of harissa in a bowl and mix it with a tablespoon of oil and salt and pepper to taste. Drop in the potatoes and stir them around to cover them with the mixture. You can do this a few hours ahead if you like. 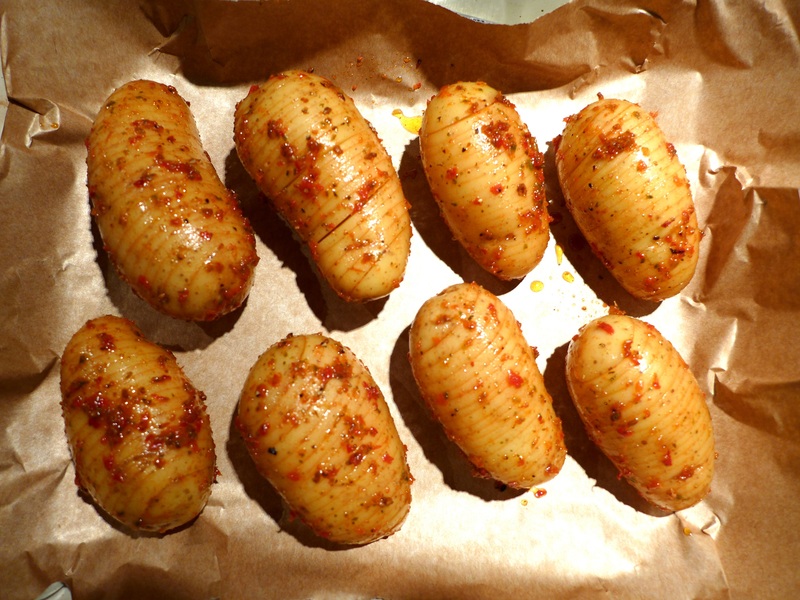 Line a roasting tin with foil or baking paper and put in the potatoes, cut-side up. Roast for 30 minutes, by which time they should have opened up. If they haven’t, coax them open with a knife. Brush with the remaining harissa/oil mix, pushing it gently into the slits, and roast for another 20-30 minutes, depending on size, until the insides are tender and the outsides have crisped up. Larger potatoes obviously will take longer. 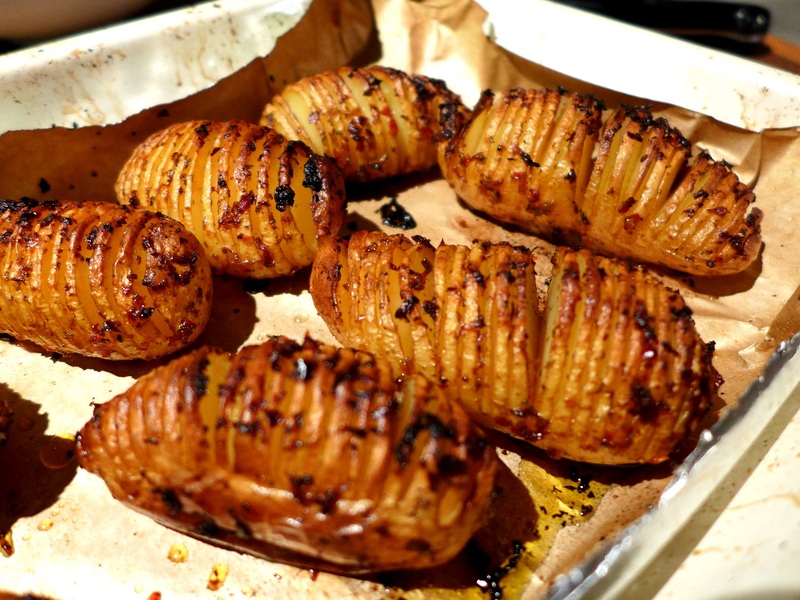 This entry was posted in Vegetables and salads, Vegetarian and tagged Hasselback potatoes, Hasselback potatoes with harissa, side dishes by Linda Duffin. Bookmark the permalink. Mmmm, it’s definitely potato weather, yum. Yours look so precise, I’m very impressed. By the way, did I dream it or did you post something about getting bee-hives. I’ve had it in my mind to go back and find it but now can’t. I’m going mad, aren’t I? They were very good and they look ridiculously cute. I couldn’t possibly comment on the sanity issue but yes, I did post something on FB about bee hives. A friend has made us an African-style hive, a sort of top loader, so we’re waiting to see if any bees find it a suitable home once the weather warms up. 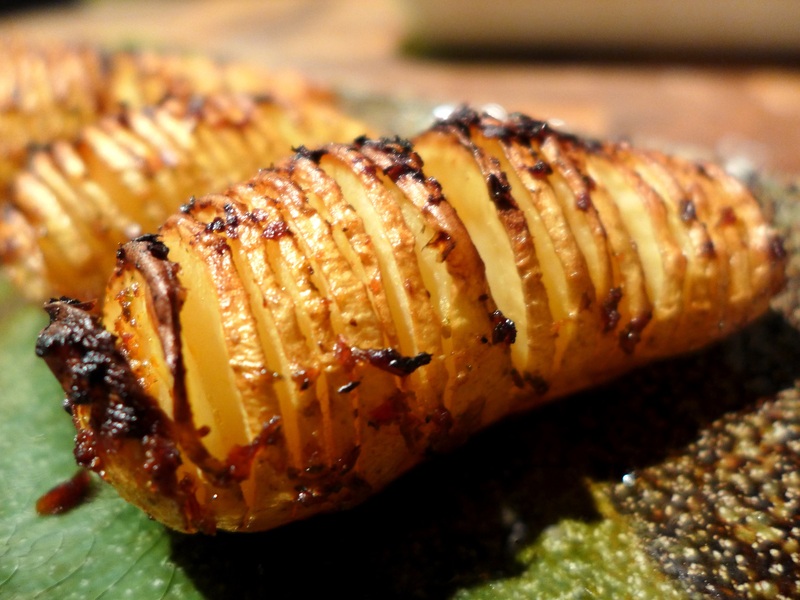 I love hasselback potatoes! Yours look delicious! 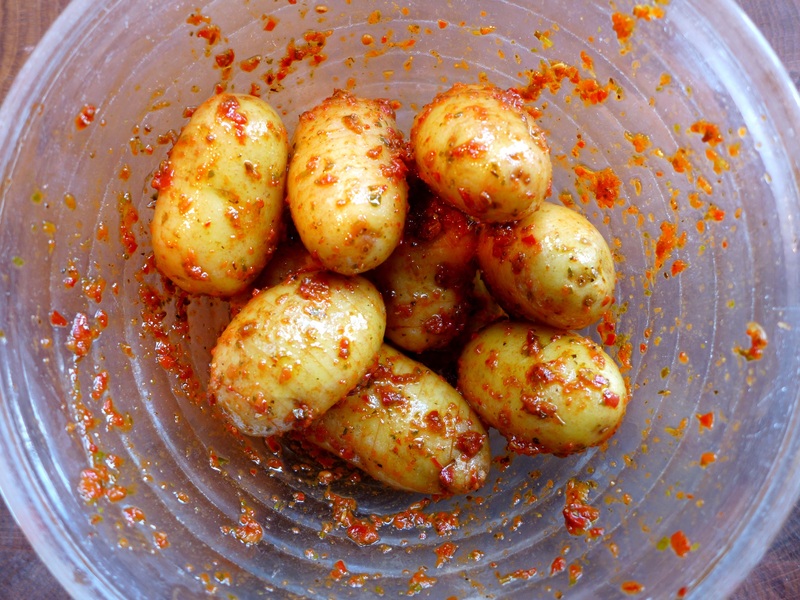 Oh, I love that you used harissa on the potatoes! I can just imagine how good these are! I need to make some!!! 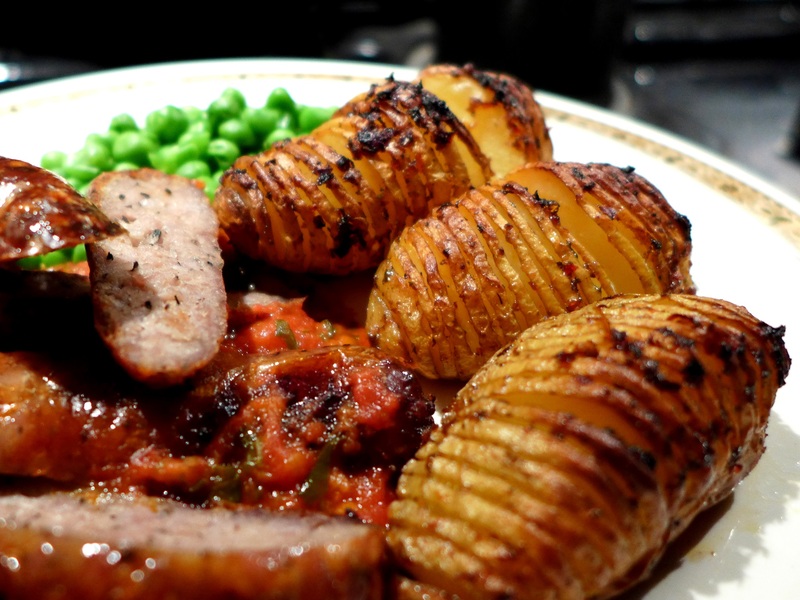 I’ve been trying unsuccessfully for some time to replicate Mom’s hasselback potatoes, Linda. Now, I think I’ll call an end to my attempts and prepare yours instead. Being a fan of harissa, I cannot wait to try this dish. Thanks for sharing!